they are always loading and unloading on the nearside. Toe protection is provided on all three working sides. 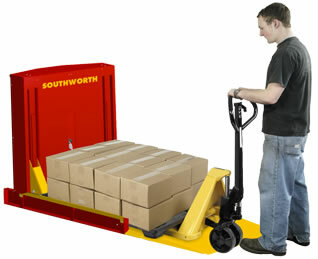 NOTES: Portability transport feature requires a fork truck or hand pallet jack with a minimum of 72 long forks. Hinged ramp is 33 or 51 long on one 44 end. Folds up onto turntable platform when portability feature is used. turntable can be rotated. Turntable is 44 wide x 48 deep with 4 high guides on 48 sides. For powered turntable ....................................................... (contact us for prices). One Touch Auto Leveling....................................................(contact us for prices). 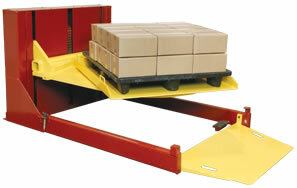 Feature, Hand Pallet Jack, and Hinged Ramp from your source for material handling equipment.